The crew assembled onboard Halimeda at Crown Bay in St. Thomas on Wednesday, May 4. After an initial orientation and briefing about the planned passage and our preparation for it, we dined ashore. Our crew consisted of Hal Sutphen, mariner, author and retired Navy Captain as skipper; Billy Psimas, a computer expert from Northern Virginia as mate; Elizabeth Hatton, a family practice physician from New York state and her husband Mike Hatton, an oral surgeon; Wayne Mueller, a retired automotive designer and woodworker from Michigan; and David Scheer, a retired electronics specialist turned historic building restorer from North Dakota. Thursday was a full day of preparation activity that included items such as inventorying equipment and verifying its stowage, setting and inspecting all working sails, setting and stowing in its ready-for-use mode the storm trysail, hoisting and stowing the dinghy outboard, hoisting and stowing the dinghy on the foredeck, and inspecting the engine, generator and electronics to ensure everything was operable and ready for use. Briefings included watch procedure, the boat’s daily routine during the passage and assignments to watch and emergency bill duties. Friday saw continuation of preparation activity, with David going aloft to inspect the rig, Elizabeth, Mike and Hal doing the provisioning, Billy getting up to date weather information and everyone participating in getting the boat fully secured for sea. The crew did such an effective job on the preparation duties that we were able to grant “liberty” for a few hours in the afternoon for shopping in Charlotte Amalie and pursuing other personal interests. HALIMEDA departed Crown Bay shortly before 9:00 am on Saturday, May 7. We motored and motor-sailed upwind along the south coast of St. Thomas to Great St. James Island, where we anchored briefly in Christmas Cove to inspect the underwater hull. Dave, an avid diver, did the inspection and aside from cleaning the speedometer paddlewheel and knocking a few barnacles off the prop, he found the bottom in good shape. Departing the anchorage at about 11:30, we quickly set sail and sailed north, passing east of St. Thomas and entering the North Atlantic through Middle Passage, just east of Thatch Cay. The wind was light – about 12 knots – and there was a substantial southeasterly swell that made the boat’s motion rather rolly. Fortunately, only one of the crew was stricken with mal de mer, and prudent use of medications helped speed the recovery process. Being one day short of a new moon, the night was very dark and the stars were spectacular – including the Southern Cross, which is visible low in the southern sky at St. Thomas’ latitude. Made 63 miles good by midnight. Sunday, May 8 found us motor-sailing much of the day, as the wind went southerly and diminished in the pre-dawn hours. The forecast called for 5 or 6 days of light winds, so we altered our rhumb line track to run parallel to the Bahamas for a few days until we were confident our fuel supply would suffice to make the balance of the passage without stopping for more fuel. We enjoyed a brief spell of northeasterly wind as we passed under an area of cloudiness and light showers, but it didn’t last very long. The light wind and still rolly sea were causing a lot of motion in the boom, and there were signs of looseness and wear in several parts at the gooseneck, so a big project for the day was to install washers under the head and nut on the bolt that serves as the horizontal pivot for the gooseneck and to tighten the connections so the parts did not move and wear one another. Made another 129 miles good. Early Monday morning the wind filled in from the north northeast and reached a sustained speed sufficient to let us sail. With clear, sunny skies and only a moderate ocean swell beneath the wind waves, it was a great day to work on celestial navigation skills, and just about everyone took a few sun lines. Best of all, the observations put us within 2 or 3 miles of the positions shown on our GPS – excellent results for navigators with limited experience. After a training session on distress signals, our major maintenance project for the day was to remove, clean and check the cockpit manual bilge pump, which seemed unable to get a suction on any water in the bilge. (The pump was perfectly fine – we later learned the “problem” was that the bilge was so dry there was insufficient water to immerse the pumps’ pickup fitting – that kind of problem we don’t mind having!) The midday weather forecast from the Coast Guard high frequency radio station was much more encouraging, so we altered course more to the north. By keeping our engine speed low when the wind was too light to proceed under sail alone, we minimized fuel consumption significantly. In late afternoon a fish struck the lure we were trolling behind the boat, and it was a hard hit. When we recovered the line, the entire brand-new lure was gone. Made another 135 miles good. On Tuesday, May 10, the wind was variable in strength but we managed to keep going under sail all day. Although there was still a swell running, sea conditions had moderated and the boat’s ride was much more comfortable. Another clear, sunny day and another day with lots of celestial navigation practice. The only problem was that our latitude was not very far north of the sun’s declination, so the sun was almost due east of us (producing north-south lines of position from our observations) all morning; it quickly swung south of us at local apparent noon and then stayed due west (more north-south lines) all afternoon, so it was a challenge to get lines that crossed to form a fix. We sighted several Bermuda Longtails today, and there were many petrels around us, skipping along the surface of the sea. We deployed the fishing rig again, but our slow boat speed reduced the likelihood of a catch. After a training session with the “Starfinder,” celestial practice continued with evening stars. By 8:30 pm the wind had died and we were motoring again. Only made 103 miles good. Most of Wednesday was spent motoring across an undulating sea, with a smooth, ripple-free surface atop the remnants of old swells from the northeast. The sky was cloudless and sunny until late afternoon, when a long bank of cumulus clouds arose on the northwestern horizon. As we approached the clouds, the wind backed slowly from northeast to west, but stayed very light. We could sail from time to time, but by evening we were under power again. Lots of sun sights during the course of the day, with impressive accuracy by all the navigators. Made only 100 miles good. Thursday dawned clear, sunny and windless, and the forecast called for another three days of similar conditions. Although we had a lot of hours of motoring, it had been at very low speed and our fuel gauge showed we still had ¾ of our fuel. We did some maintenance on the antenna connections for the single sideband radio and thought we had it fixed since we successfully made contact with an amateur station in Montreal, Canada. By midday the forecast was being proved wrong as another long bank of clouds rolled in from the northwest and this time it brought wind. It was light at first, but by sunset we were charging into lumpy seas with gusts that hovered around the 20-knot level and we reduced sail for the first time on the trip by rolling in some of the genoa. As the evening wore on, the wind moderated, but we managed to make 128 miles good for the day. Shortly after midnight the wind dropped below 10 knots again and we resumed motorsailing under a brilliant display of stars in a clear and cloudless sky. By daybreak on Friday, May 13 we had sufficient wind from the northeast to sail. The cloud cover was increasing and so was the wind. By noon we were making better than 6 knots and the wind kept us moving nicely all through the afternoon. This was our best day of sailing since leaving St. Thomas and the weather forecast was more encouraging so morale was up. Make good 138 miles. Saturday brought unsteady winds, and although we had to motor at times, we spent most of the afternoon beam reaching to the north in 10-14 knot easterly breezes. Boats to the north of us reported that their winds are light and variable, so we were happy with our steady wind. For the past three days we had been seeing hundreds of Portuguese Man-o’-War jelly fish, with their conspicuous pink/purple/blue flotation bladders. Some were the largest I’ve ever seen. We also had recurrent visits from Bermuda Longtails and we saw petrels almost every day. The sea temperature had gradually fallen from the upper 70’s to the low 70’s, and as we crossed 30 degrees north, the air had grown noticeably cooler than it was in the tropics. With a prospect for encountering more shipping as we approach the US east coast, the day’s training topic was radar and radar plotting. The wind diminished at sunset and we resumed our motorsailing, recording 123 miles of progress for the day. Sunday, May 15 found us motorsailing over a curiously lumpy sea with light winds that were gradually veering toward southeast. We headed northeast to get a better wind angle, but this had only limited effect. 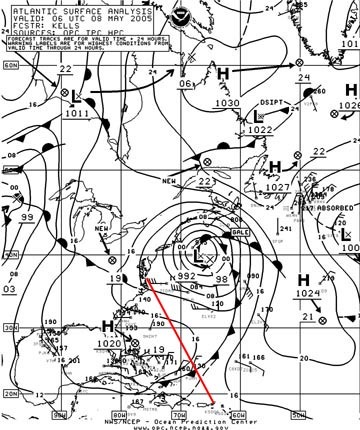 Around 2:00 am we gybed to a northwesterly heading to get on port tack for the first time since leaving St. Thomas and also to move us westward where we hoped to find more of a southwesterly wind. Billy Psimas reported hearing “small metal objects” hit the cabin top and investigation revealed that the fitting connecting the boom vang to the bottom of the boom had sheered its fastenings. We lashed the vang in place until daylight, when we do a better job of securing it with additional lashings. We also found that the cable connecting the single sideband antenna tuner to the insulated backstay antenna was corroded and broken. We replaced it with new cable and found that our radio reception and transmission were both improved markedly as a result, even though a major solar flare was playing havoc with radio propagation. We spent the afternoon with the asymmetrical spinnaker set, but the wind was so light we had to keep the engine running at low speed to keep the boat moving northward. Although the slow boat speed and the Sargasso weed that repeatedly fouled our lure minimized the prospect for catching anything, we kept the fishing line out. This afternoon our efforts were rewarded when we caught a nice size dorado. Nothing like fresh fish to enhance the cruising menu! The midnight fix showed we made 109 miles today. Monday began with light south and southwest winds that were strong enough to let us sail, but short, lumpy seas gave us an uncomfortable ride. Distant lightning flashes that seemed to be getting closer caused us to take a reef in the main, but by daybreak we had encountered no squalls or hints of gusty wind, so we shook it out again. 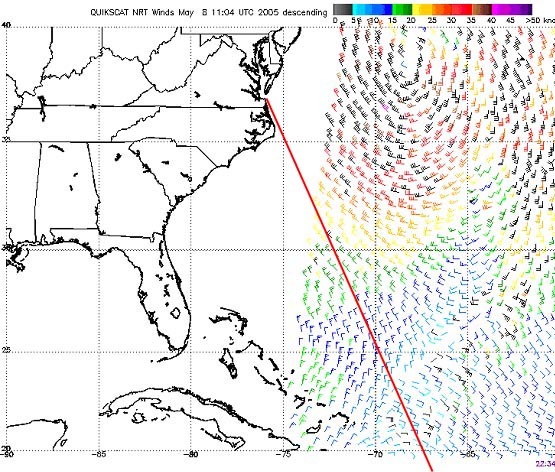 A current set us well to the west of our planned track, but this put us in a position to ride with the Gulf Stream for 60 miles or so as we approached Cape Hatteras. A long bank of heavy clouds to the northwest was first thought to be hovering over the warm Gulf Stream waters, but instead it proved to be the edge of a cold front that had been forecast to stall in the vicinity of Cape Hatteras later in the evening. The frontal zone was strangely docile. We motored is virtually still air, running almost parallel to the front as it crept eastward toward us. We slipped between several intense areas of rain and found ourselves in notably cooler air with a light west to northwest wind. 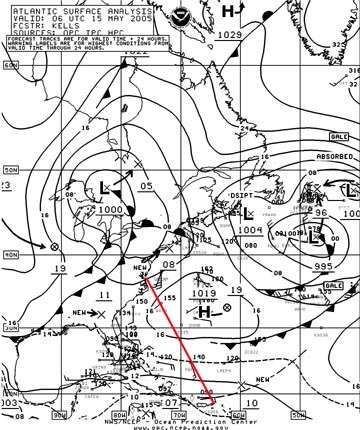 We continued to motor northward, looking to pick up a push from the Gulf Stream. At 4:15 we were passed by a southbound tug towing what proved to be the ex-USS GUADALCANAL. The tug reported they were taking her “offshore on a one-way trip,” apparently to be sunk for a reef or disposed of in deep water. At about the same time we were surrounded by an enormous school of dolphin, both gray and spotted, and they put on a spectacular show for us. At times there were a dozen or more frolicking in our bow wave, and several did repeated leaps and splash-landings. The school must have included at least 50 of them and they stayed with us for nearly an hour. 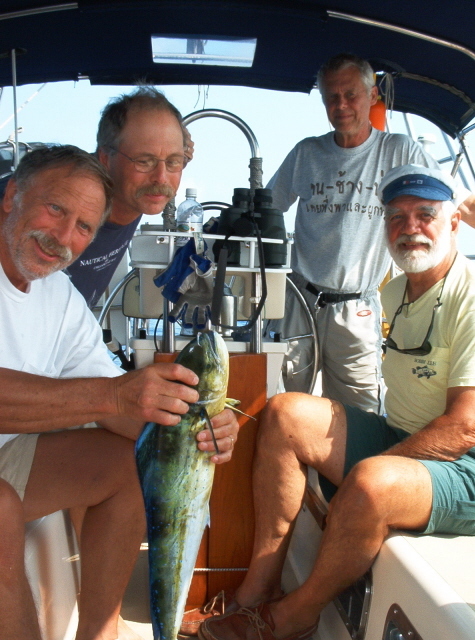 By late evening we were riding the Gulf Stream northward with a light westerly wind. We had our best day of the trip, making 141 miles good. 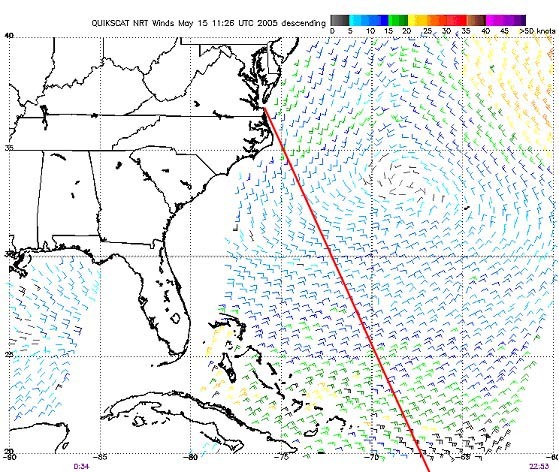 Tuesday, May 16 began with HALIMEDA sliding through Gulf Stream water that was nearly 80 degrees, getting boosted to the northeast at about 4 knots, making our speed over the bottom more than 7 knots most of the time. We encountered a Gulf Stream squall, with wind and rain, that caused us to reduce sail to double reefed main and staysail, but it was short-lived and we were soon putting sail area back on. We exited the Gulf Stream and the change was abrupt. Water temperature dropped to 55 degrees, the color changed from cobalt blue to greenish-black and the sea smoothed out nicely. We deployed the fishing rig early and soon had a 30” bluefish on the cockpit sole ready to be filleted. With fresh fish in the refrigerator, we put the line out again while we ate breakfast, and as soon as we finished eating we caught another blue. We put the line and lure back in the water to get it out of our way and just as we were about to bring it in and stop fishing, a third blue fish took the lure. All three were about the same size and provided us a fish feast for supper. With a pleasant 15 knot breeze from the northeast, we had a pleasant day of sailing as we gradually approached the Carolina-Virginia coastline. We made radar landfall about 4:20 pm and by midnight we were nearing the mouth of Chesapeake Bay, having made 130 miles for the day. Wednesday, May 17. We entered inland waters for COLREGS purposes at 1:28 am and proceeded up Thimble Shoals channel, passed through the Chesapeake Bay Bridge-Tunnel and entered Little Creek at 3:27. We moored at Taylor’s Landing Marina at 3:49 am, having come 15 miles since midnight. Despite the hour, the crew was full of energy and immediately turned to the chores associated with the end of the passage: washing down the boat and sails, restowing everything in its assigned place, getting the dinghy off the foredeck and slung from the davits at the stern, cleaning the interior from end to end, filling water tanks and packing personal gear. As soon as the marina attendant arrived we refueled (having consumed only 71 gallons in our 119 hours of motoring). A call to Customs at 7:15 got us cleared in and then we were off for a shore-side breakfast – at the local McDonald’s, of course! Rapid phone calls identified available flights, travel plans were made and by noon the crew was on its way home. HALIMEDA was sitting in her berth and the first repairman arrived to start the process of getting her ready for her next trip: a passage to Bermuda.